Sunday Times’ Unfair iPad vs Kindle Comparison debunked, shows sign of Apple Bias? The Kindle’s much-hyped E Ink display is easier to read in direct sunlight, but this is England. We only do direct sunlight for two or three weeks a year. If you’re used to a crisp and twinkly smartphone screen, reading on the kindle will feel like squinting into an old gravestone. It’s grey and gloomy, and there’s no way to brighten it up – unless you buy the leather sleeve with a built-in reading light (about £50 extra). It’s also hopeless for picture-based books (cookery, travel, art). The iPad’s high-def, high-contrast, constantly refreshing LCD screen may deliver a bit more retinal stress over long sessions but at least it has adjustable brightness without losing clarity. The article starts out badly, by deflecting one of the Kindle’s key advantages over the iPad with a jokey remark about British weather. That and it’s just not true; according to the Met Office, the UK has on average 1354.9 hours of sunshine per year, roughly 30% of the maximum amount of sunshine possible. So it’s not a huge amount but it’s certainly not to be sniffed at. The picture below demonstrates just how much of an advantage the ability to read in bright sunlight is, particularly if you’re off on holiday and plan to spend time reading on the beach but don’t want to fill your suitcase with bulky Stephen King novels. You’d imagine that saving space in your holiday luggage would be one of the most appealing aspects of the kindle to a lot of people, especially considering the often extortionate prices put on airplane baggage allowances. So the Kindle is “grey and gloomy”? Well since the screen on it looks less like a screen and more like the page of a book then I guess that makes reading a book like “squinting into an old gravestone” as well? Sure it might not be as bright and colourful as the iPad but that’s precisely why it works so well as an e-reader; you can spend hours using it, without eye strain or headaches. The article makes a fair point about it being hopeless for picture based books though, the non-colour e-ink screen isn’t the best way of displaying pictures and while the odd image in a book looks fine, it’s not going to replace art or photography books anytime soon. Although I feel I should mention that while the Times article points out the Kindle’s inadequacy of displaying cookery and travel books, it neglects to mention that the iPad isn’t ideally suited to this either. Would you really want to prepare food and fill containers with boiling water with an expensive electronic gadget nearby? Similarly, you wouldn’t feel too comfortable walking through the streets of Hong Kong reading a Lonely Planet guide on a device costing £500. On a slightly related note, I’d argue that the Kindle is a better ‘holiday device’ than the iPad since not only is it cheaper to replace if something happens to it but also, the 3G version features comes with free internet coverage for over 100 countries, meaning if you’re abroad and need to find out a phone number or address in a pinch, you can do so without breaking the bank by checking using your phone’s 3G. While the iPad’s screen is no doubt the ‘winner’ for an all –round entertainment device, the comparison here is for an e-reader and this is where the Kindle shines. The Kindle is styled in a dour and dated plasticky mould – a throw-back to late 1990s PDAs, with their corporate sexlessness and losable pointers. But it is light: about the weight of a standard novel. While you can comfortable grip a Kindle in one hand for a long period without any biceps burn, the iPad demands a lot of fiddling and propping to manoeuvre into a decent reading position. It’s more than twice as heavy as the Kindle, too, which means the one-handed approach is for amateur shot-putters only. Winner: It’s a draw. The Kindle is best for pure reading; the iPad is pleasurable but impractical. I can’t understand why the Kindle didn’t win this category, especially since the article admits that the Kindle has the weight of a novel and is vastly more comfortable to hold than an iPad. Also, the article states that “the Kindle is best for pure reading”; well surely that’s all this article is comparing? 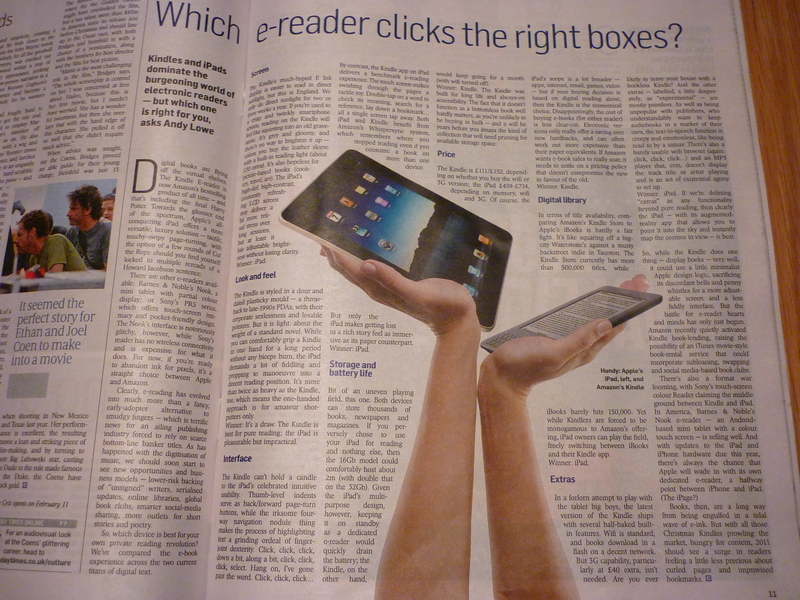 It is titled “Which e-reader clicks the right boxes?” after all. By contrast, the Kindle app on iPad delivers a benchmark e-reading experience. The touch screen makes swishing through the pages a tactile joy, Double-tap on a word to check its meaning, search for a reference, lay down a bookmark… all a single screen tap away. Both iPad and Kindle benefit from Amazon’s Whispersync system, which remembers where you stopped reading even if you consume a book on more than one device. But only the iPad makes getting lost in a rich story feel as immersive as its paper counterpart. Can’t argue with the verdict in this case as the iPad’s interface, like that of most touch screen devices makes navigation a joy. The buttons and the apparently ‘irksome four-way navigation nodule’ can indeed be frustrating when trying to type lengthy paragraphs or highlight chunks of text and it seems that if the Kindle is to ever catch on among students using it for academic work then the highlighting/reference system will need to be made a lot more intuitive. As it is though, 95% of the time spent on a Kindle will be spent reading and making use of the page turn buttons is problem-free. Similarly, most people will be using the Kindle’s limited keyboard to either search for a word in a book or in the in-built dictionary or searching for a book title in the Amazon store and for casual use like this, the clunky keyboard and navigation is surprisingly tolerable but this aside, the iPad wins at this category hands down. Although, I take issue with the Times’ claim that “only the iPad makes getting lost in a rich story feel as immersive as its paper counterpart” since not only does the Kindle screen better resemble the paperbacks it is trying to emulate than the iPad, the lack of a backlight means less eye strain and so you’ll spend longer being immersed in a story without having to take a recommended 15 minute rest break every hour. Bit of an uneven playing field, this one. Both devices can store thousands of books, newspapers and magazines. If you perversely choose to use your iPad for reading and nothing else, then the 16Gb model could comfortably host about 2m (with double that on the 32Gb). Given the iPad’s multi-purpose design, however, keeping it on standby as a dedicated e-reader would quickly drain the battery; the kindle, on the other hand, would keep going for a month (with wifi turned off). Winner: Kindle. The Kindle was built for long life, and always-on accessibility. The fact that it doesn’t function as a bottomless book well hardly matter as you’re unlikely to be buying in bulk – and it will be years before you amass the kind of collection that will need pruning for available storage space. Finally, the article has acknowledged the ‘uneven playing field’ and that comparing an all round multimedia device to an e-reader is bizarre to say the least. The Kindle was obviously always going to win at this category with an estimated battery life of three to four weeks depending on wifi usage thanks largely to the e-ink technology which doesn’t drain battery power to display text, only to change the page. Strangely, this is the first article I’ve seen about the Kindle that has been anything other than wholly positive about the Kindle’s storage space. Amazon estimates storage of up to 3,500 books but since the manufacturers descriptions are usually slightly generous, how about we say 3,000 for arguments sake. Now let’s suppose someone reads a book a week, as well as only buying e-books rather than physical books. At that rate of buying 52 books a year it’d be roughly 57 years before the Kindle’s capacity is filled, and that’s only at the low estimate of a 3,000 e-book capacity. Now in the unlikely event that a pensioner has amassed a collection of 3,000 e-books, chances are that in the half a decade that has passed, Amazon will have released a newer version of the Kindle with even more storage space so any criticism of the Kindle’s storage is, quite frankly, absurd. As the article says, if you were to use an iPad only for reading books, the storage would be far more than the Kindle but then again if you are only using it to read books, why not just buy a kindle in the first place and save yourself £400? The Kindle is £111/£152 depending on whether you buy the wifi or 3G version; the iPad £439-£714 depending on memory, wifi and 3G. Of course, the iPad’s scope is a lot broader – apps, internet, email, games, video – but if your buying decision is based on digital reading alone, then the Kindle is the economical choice. Disappointingly, the cost of buying e-books (for either reader) is less clear-cut. Electronic versions only really offer a saving over new hardbacks, and can often work out more expensive than their paper equivalents. If Amazon wants e-book sales to really soar, it needs to settle on a pricing policy that doesn’t compromise the new in favour of the old. Can’t disagree with this, the Kindle is obviously going to win in terms of price and the article does point out that purely for reading, the Kindle is the best choice, though why couldn’t they have pointed this out in the other categories instead of unfairly comparing a tablet with an e-reader? Also I can’t help but feel that the article slightly exaggerates the amount of e-books that are more expensive than the paper versions. Based on personal experience the e-book versions are mostly cheaper by around 50 pence and under, and occasionally more expensive, but other people may have had different experiences of this to me, so I’m happy to let this slide. Another minor criticism though, is that when the article claims that “if Amazon wants e-book sales to really soar, it needs to settle on a pricing policy that doesn’t compromise the new in favour of the old”, while I do agree with this sentiment, it could also be levelled toward Apple’s iBooks, but the article strangely fails to mention this, implying that the pricing on Apple’s own bookstore is cheaper, when this certainly isn’t the case. In fact, thebookseller.com reports that “virtually all the books in the iBookstore’s top 20 are available to buy more cheaply as paperbacks from Amazon.co.uk or as e-books for the Kindle via Amazon.com”. In terms of title availability, comparing Amazon’s Kindle Store to Apple’s iBooks is hardly a fair fight, it’s like squaring off a big-city Waterstone’s against a musty backstreet indie in Taunton. The Kindle Store currently has more than 500,000 titles, while iBooks barely hits 150,000. Yet while Kindlers are forced to be monogamous to Amazon’s offering, iPad owners can play the field, freely switching between iBooks and their Kindle app. So “comparing Amazon’s Kindle Store to Apple’s iBooks is hardly a fair fight”? A bit like comparing a tablet computer with an e-reader with the same expectations towards both, no? While in theory you can understand why iPad may be crowned champion in this category, the article fails to mention of the 150,000 titles iBooks owned, most are also available in the Amazon Kindle store. So this ‘playing the field’ the article speaks of isn’t really an advantage. The problem with using iBooks at all is that it’s severely limiting if you wish to change your mobile phone, mac, or iPad to something not made by Apple. As it stands, the Kindle app is available on PC, Android, iPad, iPhone, Mac, and even the new Windows Phone 7, whereas iBooks is, obviously, only available for apple’s own devices. Given Android’s increasing market share and the fact that more tablet computers are being brought out every month, there’s no point in limiting yourself to Apple’s hardware and software. Supposing you do decide to switch from Apple to Kindle (for example), you’d have to convert all your e-books into a different format using software such as Calibre so that they’d be usable on another device but if you’d stuck with the Kindle store all along, you’d have no trouble reading your existing library on another device regardless of whether it’s made by Apple, Android or Windows. Of course the Kindle couldn’t win this category either since what’s available on the Kindle is also available on the iPad through the Kindle store app, which is precisely why this category should have been ruled a draw. In a forlorn attempt to play with the tablet big boys, the latest version of the Kindle ships with several half-baked built-in features, Wifi is standard and books download in a flash on a decent network. But 3G capability, particularly at £40 extra, isn’t needed. Are you ever likely to leave your house with a bookless Kindle? And the other extras – labelled, a little desperately as “experimental” – are mostly pointless. As well as being unpopular with publishers, who understandably want to keep audiobooks in a market of their own, the text-to-speech function is creepy and emotionless, like being read to by a satnav. There’s also a barely usable web browser) again: click, click, click…) and an MP3 player that, erm, doesn’t display the track title or artist playing and is an act of existential agony to set up. Winner: iPad. If we’re defining “extras” as any functionality beyond pure reading, then clearly the iPad – with its augmented-reality app that allows you to point it into the sky and instantly map the cosmos in view – is best. Again, I agree with the verdict but disagree with a lot of the points made. The iPad will always trump the Kindle on the extras front, largely because the Kindle is not attempting to offer any sort of competition in this aspect. It’s an e-reader first and foremost. While personally, I agree that the 3G capability doesn’t appeal to me which is why I sprung for the wifi model, I’m sure there’s a lot of people who frequently travel abroad for business to whom the 3G sealed the deal. As for the browser, yes it’s basic and will have trouble displaying a lot of content on some websites but I just see it mainly as a way of accessing more content for reading. Primarily the Amazon store, (which is browser based, duh!) but also websites like Project Gutenberg which has an archive of over 33,000 free e-books that can be downloaded directly to your Kindle. Best of all, the site’s basic layout and lack of flash content means it displays perfectly adequately on the “barely usable web browser”. It seems like less hassle doing it this way using a few cumbersome ‘click click clicks’ than to download content onto your PC then connect the Kindle via USB and drag and drop content onto the device. Besides, Amazon itself admits it’s not perfect by placing it under the ‘experimental’ menu. Perhaps one day news outlets will offer Kindle specific versions of their websites but until then, as the Times pointed out, it does indeed have its flaws. The Kindle/iPad comparison is always going to be unfair unless you focus purely on the e-reading experience. The Kindle aims solely to be a portable library that is accessible, reliable and easy to read from and in this regard it trumps the iPad. Of course the iPad is better at displaying images, can play video content, use apps and has a better browser. But then again pretty much anything an iPad can do that is actually of some use, a smartphone can also do. According to Nielsen, smartphones are set to overtake feature phones this year and it seems like owning a Kindle and smartphone is a better combination to have than an iPad and smartphone since after all, an iPad is essentially an enlarged iPhone. I may well be wrong, but it just seems like this article sets out to discredit the Kindle from the start and anyone who’s spent a serious amount of time using one would be able to point out several errors in the Times’ comparison. What do you think of this article? Anything you agree or disagree with? Share your thoughts in the comment section! Also, click here to follow us on Twitter. 7 Responses to Sunday Times’ Unfair iPad vs Kindle Comparison debunked, shows sign of Apple Bias? It was a very flawed comparison. It compared a dedicated book reader against a fully functioning computer and judged the computer the best ebook reader because it does more other things than the ebook reader. But why an iPad? Surely any computer would win on those basis. -Book capacity of Kindle is really unlimited because a copy of all the books you buy are saved on teh Amazon site and so you can clear them from the Kindle device when read and download again when you want to re-read them. -Comments on casing is a matter of taste, but the matt casing of the Kindle is non-slip and thus easier to hold. – Touch screen? I don’t want to touch the screen of a reader and get finger marks over it. – I scream when I hear apple-heads claim their devices are ‘intuitive’ — yes, they are if you have already learned how to use them, just as Windows is. But put one in the hands of someone who has never touched one before and listen to them asking how to use it. The other thing the article fails to mention on the price issue is that Amazon can’t actually do anything about the prices thanks to the agency model so saying it’s something they need to sort out when it’s actually something Apple have caused is ill informed. All in all it’s a terribly and poorly thought out comparison by someone who really doesn’t seem to have much of a clue. What’s worrying is that there are a lot of uninformed people out there who will have read this article and formed opinions based on it and the Sunday times really have more of a duty to report fairly and accurately. Is there anyway to actually contact the Times directly and comment on this article? You could try Culture and arts: culture@sunday-times.co.uk. if you take out £1.00 30-day subscription you may even be able to locate Andy Lowe’s email address. I’m amazed and pleasantly surprised that others have felt irked enough to comment on this article. I was made aware of it through friends having purchased a Kindle as a Christmas present for my wife, and I have mentioned to her many of the issues raised by other commentators here. I searched Google for Andy Lowe’s contact details and lo and behold came across this site! yes….I bought a kindle, because I want to read hours and hours, and I respect my eyes. Kindle is very small and only weights 241 grams, against 640 grams for the Ipad. Ipad, is a monster, but if you want some device that replace just paper books, the best is Kindle.